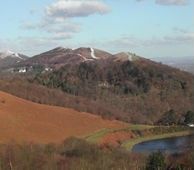 The Malvern Hills within the Abberley and Malvern Hills Geopark. eology and landscapes do not stop at county boundaries! Across Britain there are distinctive landscape areas of particular geological interest that have been termed “Geoparks”. These are places where the landscape attracts tourists and where the geology makes such a special contribution to the character of the area, that it can add a valuable extra dimension to the visitor’s experience. There are around 50 Geoparks worldwide and several in the United Kingdom, each driven by a partnership, including AONB authorities and a range of community, heritage and education organisations. Many activities and venues are used to enthrall the geo-tourist – guided walks, exhibitions, visitor attractions, Rock & Fossil Roadshows and geo-walking trails, including the new long distance trail from Bridgnorth to Gloucester following the ancient spine of the Malvern Hills. 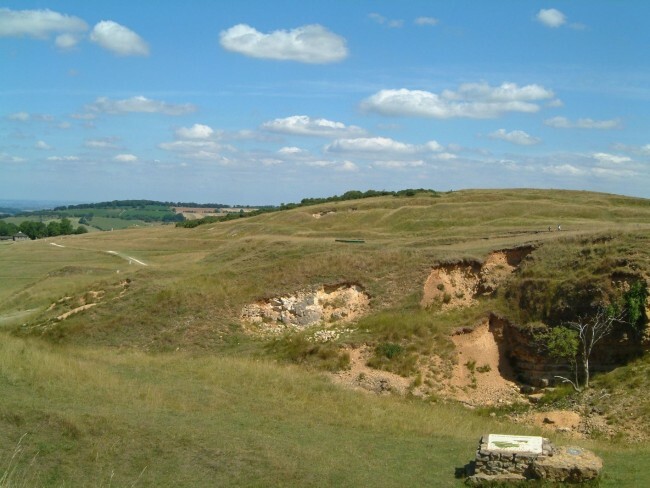 Two Geoparks incorporate parts of several Geology Trusts counties. Both involve our member groups as lead partners. They are the Abberley and Malvern Hills Geopark and the Cotswold Hills Geopark. Rolling Bank at Cleeve Common, part of the Cotswold Hills Geopark. Geodiversity … the wide variety of rocks, minerals, fossils, soils and landforms, and the natural processes that shape the landscape. These provide the framework for life on Earth. Copyright © 2019 The Geology Trusts - all rights reserved.